Steeda's GT500 Power Pack includes our Industry Leading 114mm Cold Air Kit, a 2.7" 3psi supercharger pulley and an SCT XCalibrator 4 programmer to tie it all together in one convenient package. Steeda's Cold Air Kit for the new Shelby GT500 produces the greatest power gains of any Cold Air Kit on the market. In house testing has shown increases of up to 80 HP to the rear wheels when using the components in this kit. This kit is supplied with a stainless steel air box with built-in Super Velocity Stack. Steeda's velocity stack helps to increase air flow by smoothing out incoming air. 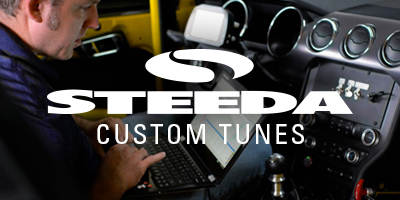 Steeda's Cold Air Kit mounts in the factory location with the supplied rubber trim to keep the hot air out. This Cold Air Kit also offers the largest mass air meter on the market at over 114 mm! Our tests showed inlet temps a mere 5 degrees above ambient temperature. The Steeda Lifetime Filter can easily be cleaned and re-oiled, making maintenance a snap. All stainless steel hardware required for installation is included in the kit. Dramatically More Horsepower and Torque to the rear tires! Exceeds OEM Quality, with superior durability. WARNING:Not approvedfor sale in California or states that require a California E.O. #. This part has been designed and is intended for off-road application only. Installation of this part on a vehicle that is driven on public roads may violate U.S. and Canadian laws and regulations. This productdoes notsupport any changes to the emissions systems on the vehicle including but not limited to catalytic converter and EGR deletes.